On this page AutographsForSale.com offers sports caps and hats and AUTHENTIC LICENSED stitched jerseys. 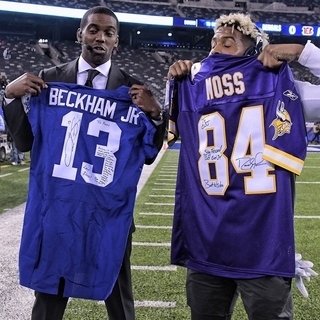 Featured at right is a Randy Moss stitched Minnesota Vikings Reebok throwback jersey ESPN bought for Moss to sign and exchange with Odell Beckham Jr. at the Nov. 14, 2016 Monday Night Football game. As shown on ESPN Outside the Lines, the vast majority of jerseys sold on the internet are cheap counterfeits made in Asia with vinyl numbers made to look like cloth, which is why the numbers look shiny and/or wrinkly. Not to mention they smell funny and may not survive even one machine washing. AutographsForSale.com sells the highest quality AUTHENTIC LICENSED jerseys stitched with real cloth tackle twill name and numbers right here in the United States just like the players wear. NO BOOTLEGS OR COUNTERFEITS! The caps, hats and jerseys in this section are NOT AUTOGRAPHED!